EcoCrew Environmental Awareness Programme, South Africa. Greyton Transition Town is the first official Transition group in Africa, initiated in December 2012 by Nicola Vernon, who said “as a driver for social integration it’s the best I’ve encountered in 30 years of working in social welfare”. Greyton is a beautiful town, visited by many tourists, but like many places in South Africa, one that still bears the scars of apartheid. The division this caused is still visible today. Many residents suffer from poverty, poor education, unemployment and deprivation. Greyton Transition Town is unusual in being resourced by some of the profits of two businesses it has established, an EcoLodge, offering affordable accommodation, and a vegetarian/vegan restaurant. While the GTT team run projects with universal appeal, much of the focus of their work is on environmental and humane education in local schools. It’s a story beautifully told in this video, made especially for ’21 Stories of Transition’. 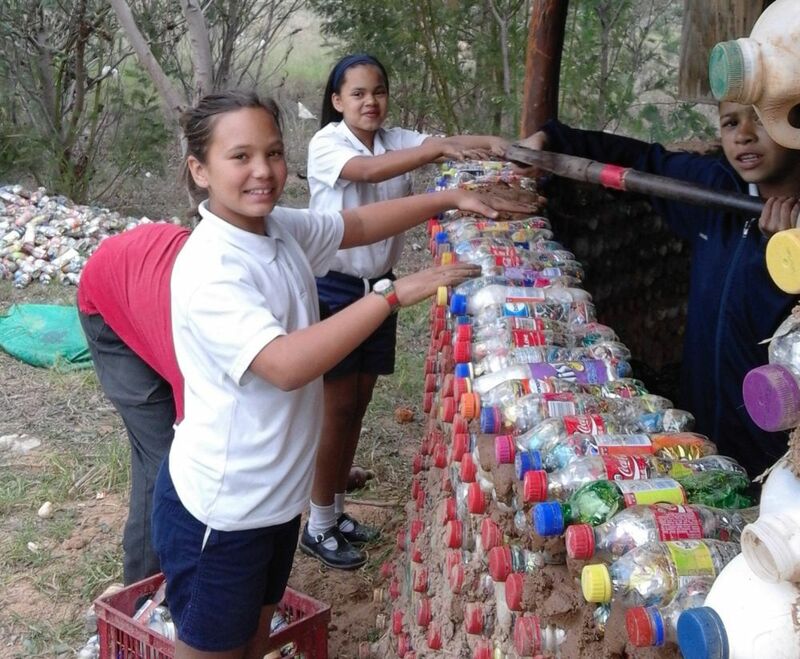 Claiming back and rehabilitating a large section of the municipal dumpsite, turning it into a Green Park, planting 500 trees as part of the Greyton Fruit Forest, and building an outdoor classroom using ‘Ecobricks’ (plastic bottles packed with non recyclable plastic waste). Learning about permaculture and creating organic food gardens in all six local schools, the produce enabling the schools to give good meals to their poorest students. 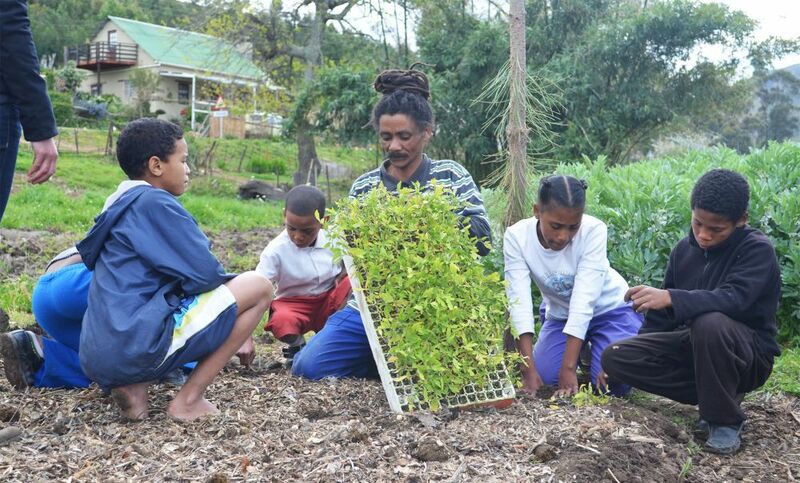 Riaan Strydon, Greyton Transition Town volunteer, teaching EcoCrew youth about permaculture. Photo: Nicola Vernon. “Most problems with historically disadvantaged children in South Africa stem from their lack of hope. They are not motivated to study when there is so little opportunity – only unemployment or a low paid job as a waiter, gardener or domestic help. All our children now have the EcoCrew to aspire to, it gives them hope and has lifted the whole school”. Rodney Cupido, Head of Emil Weder High School. Setting up ‘Swap Shops’ in local schools: spaces where children and their parents can bring clean, dry, recyclable waste and receive vouchers, which they can exchange at an on-site shop, to purchase essentials such as clothes, toiletries, blankets and school clothing. 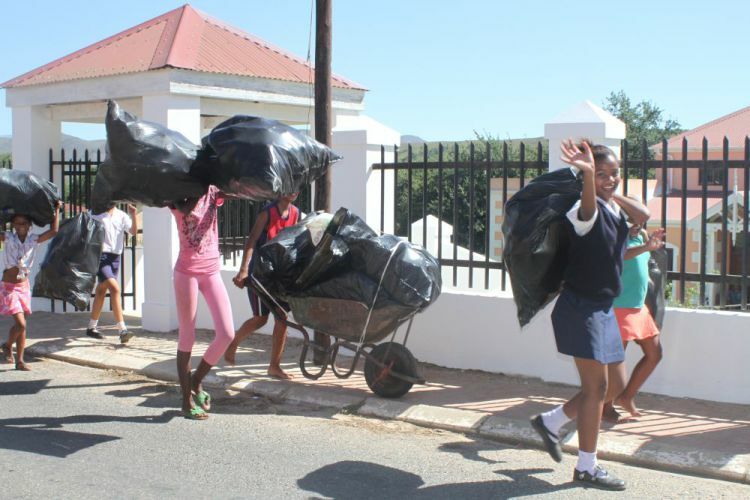 Students on their way to the Genadendal swop shop. Credit: Candice Mostert. their work in South Africa (replanting an ancient milkwood forest on the south coast) and in Zambia (to help reforest part of the country devastated by illegal tree felling). Setting up a trial humane education programme aimed at inspiring empathy in children for themselves, their friends, parents, teachers and the environment. Anything is possible if you just put your mind to it. We are always persistent in what we do. Whoever you are, as an individual, you can make a change, people will see, people will follow, because it’s about the way you do these things.